Earthship designs are made completely from natural and upcycled materials. They are built with the intention of being “Off-The-Grid ready”. This means they place minimal reliance on public utilities and fossil fuels. They are also constructed to use available natural resources -- in particular energy from the sun, and rain water. Constructed using natural and upcycled materials. Water harvesting and long-term storage. Earth Sheltered Houses are typically built into the side of, or underneath the ground. This could be through ‘Earth Berming,’ where earth is piled up against exterior walls and packed, sloping away from the house. Or, they could be classed as ‘in-Hill Construction’ where the home is set into a slope or hillside. There is usually only one wall visible, the rest are surrounded by earth. Some houses are completely underground, otherwise known as Fully Recessed Construction. This is where the ground is excavated, and the house is set in below grade. Thermal mass: generated by the earth surrounding the building, warming the house in winter and cooling it in summer. Pre-fabricated designs are houses that are constructed off-site. Once complete, they are shipped to your chosen location and even assembled for you. 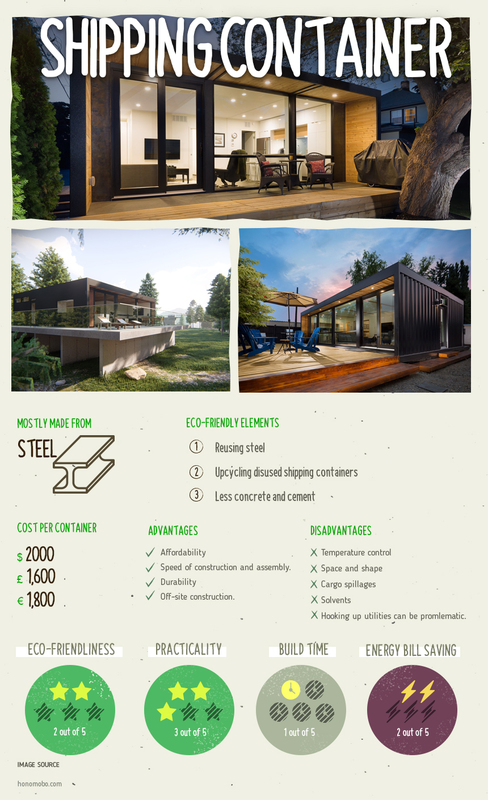 Green Construction: Prefabricated houses use less energy during construction. Green Materials: Typically built with environmentally friendly and recyclable materials like wood and steel. Wastage: There’s less wastage during construction. Homes made out of shipping containers! They have grown in popularity over the past several years due to their inherent strength, wide availability, and relatively low expense. Reusing Steel: for each recycled shipping container, 7,000 pounds of steel become reused. Less Concrete & Cement: the only concrete that you will need will be for the foundations. Tiny houses have become so popular that they have their own ‘movement’. Generally, they are under 500 square feet. Easier to build with recycled, repurposed and salvaged materials. Reduced life cycle cost of materials. Can be mostly powered off solar and wind resources due to size. Catch and filtration of rainwater. Roof Stores are online roofing supplies and materials specialists. Part of SIG plc, they work with clients ranging from household DIY enthusiasts to large-scale roofing contractors.